My daughter is looking for a young adult, or maybe kids, book that she read about a normal girl who one day notices a boy looking back at her through a mirror. Then he pulls her through into another world where they have dragons as familiars, there are talking cats and everyone has a corresponding person/soulmate/double of some kind. It's supposed to be part 1 of a series or just has a sequel. It ends in a cliffhanger, and she can't figure out what the book was to finally read the sequel. She doesn't remember any character names. Chrissie thought she had troubles -- until she fell through the mirror into her double's life. He said his name was Chris, and his world was the mirror image of hers. His world was ruled by magic -- and about to be destroyed by the sorceress Lori Lee! Chris is desperate. He has cast a powerful spell and sees the evil plot. Chrissie is the only one he can trust. Together they must save his world before it's too late. But is Chrissie about to be lost forever in the universe beyond the mirror? 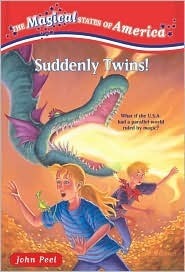 Goodreads lists the sequel as "Twice the Trouble!". This could possibly be Philip Pullman's His Dark Materials trilogy, although some of the details don't match. In that series, it is the girl - Lyra - who is from the world where everyone has a familiar, and there are talking polar bears, not cats. In the second one, Lyra gets into our world, and meets a boy, Will. I don't recall anything about a mirror though. It sounds like the second book from His Dark Materials by Philip Pullman. Will is the boy and Lyra is the girl. They enter different versions of each other's worlds through windows that Will cuts open with a knife. It's called The Subtle Knife. Lyra has a 'demon', a companion that can change shape into different animals/insects that talks kinda like Jiminy Cricket from Pinocchio.